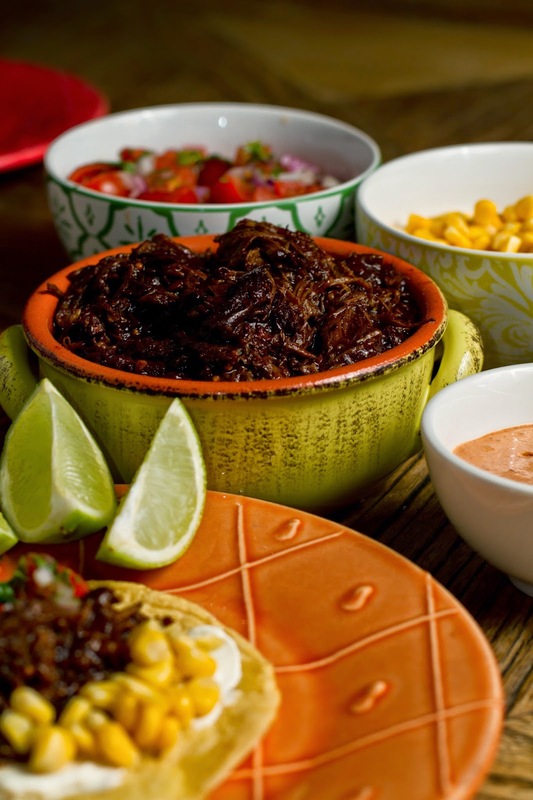 Pulled beef is not only mouth-watering delicious it is a fantastic base for any Mexican dish. Once you have made up a batch of this you can create Taco's, Burrito's, Nacho's and all manner of wonderful Mexican dishes. This recipe is more in the vain of Tex- Mex cooking rather than being a traditional Mexican dish. If you want to try cooking some traditional Mexican food I would recommend trying out the books and TV series by Rick Bayless. Rick's life mission has been to travel Mexico learning about traditional ingredients and techniques and presents them in easy to follow formats. I recommend Authentic Mexican and Fiesta at Ricks. If you want more Tex Mex cuisine you should get your hands on Tex Mex from Scratch by Jonas Cramby. America's proximity and Mexican population make the purchasing of Mexican ingredients very easy. We are not so lucky here is Australia. Whilst the Mexican craze has caught on it just isn't popular enough to make specialist chilli's and other Mexican ingredients an easy find. We order ours online at Fireworks Foods who sell Australia's largest range of Mexican foods. Dry toast cumin and coriander seeds till fragrant. Grind till fine in a large mortar and pestle. Add chopped chipotle and ancho chilli's, paprika, peppercorns and garlic and continue to pound till a rough paste is formed. Heat pressure cooker to saute mode or use a fry pan to heat 2 tbs of vegetable oil. Generously salt all sides of the beef and briefly brown beef on all sides till sealed. Remove beef from pan or pressure cooker and allow to cool till you can hold it with your hands. Rub paste into the surface of the beef till you have the whole surface coated. Put beef into pressure cooker and add stock, vinegar, tomato paste, oregano, bay leaves and whole onions. Ensure liquids are poured down beside the beef so you don't wash off all of the rub. Cook in pressure cooker till meat falls apart when pulled apart with forks (approx 60 minutes). If you don't have a pressure cooker you could do this in a heavy based pan or casserole dish in a moderate oven, it will take 4-5 hours. Once tender remove meat from liquid and set meat aside. Add mustard to the liquid, put pressure cooker back on saute mode or if you are using a pan or casserole dish put it back on a medium heat/flame. Boil liquid till it has reduced by half. Whilst this is reducing take the meat and shred it by pulling it with two forks in opposite directions. Lay shredded meat out in a shallow dish. Once the liquid has reduced pour it over the top of the meat so it is evenly coated. Here you have your Spiced Pulled Beef and you can serve it many ways as suggested above. I like to make small tacos from soft corn tortillas in the traditional Mexican style. Making your own tortillas makes a huge difference and they are very easy to make. If you purchase a bag of yellow or white corn masa mix you can follow the instructions outlined on the bag. Once you have made your own tortillas you won't go back to store bought. With the same ingredients and some large store bought or homemade tortilla wraps you can make an awesome burrito, even better with some white or Mexican rice added to the mix and some lettuce for that crunch. With your left over tortillas chop them into little triangles, toast them in the oven with a little Cajun spices sprinkled on them and va voom you have the making of nachos. It is like the meal that keeps on giving.